The National Security Archives this week released documents relating to assurances the USSR was given regarding NATO expansion. 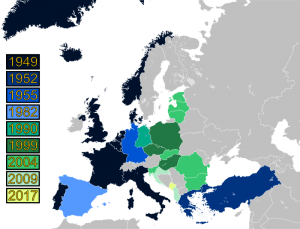 NATO has expanded in the years since to include ten more countries, including Poland, Hungary, the Baltic states, and others. NATO now reaches the Russian border. Shifrinson is assistant professor at the Bush School of Government, Texas A&M University. He wrote the award-winning academic article “Deal or No Deal? The End of the Cold War and the U.S. Offer to Limit NATO Expansion.” He also wrote the Los Angeles Times op-ed “Russia’s got a point: The U.S. broke a NATO promise.” See here. Shifrinson’s forthcoming book is Rising Titans, Falling Giants: Rising States and the Fate of Declining Great Powers (Cornell University Press).